In the same spirit of sharing, we wanted PlanetOcean trip to be useful to others. Thanks to the generosity of artists around the world, we will discover and promote artists whose donations will enable an auction for the benefit of the humanitarian organisation for children: “Un Regard, Un Enfant”. 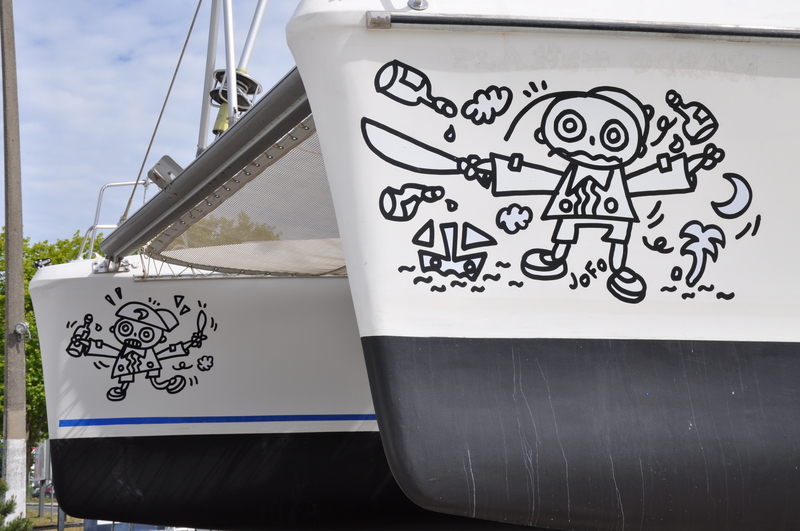 PlanetOcean turns into an art gallery displaying on her hulls in form of stickers (thanks to the generous participation of Artistick ) the artworks donated to the association. Artists from Bordeaux (France), such as Jofo responded to our call and actively supports us. We can already appreciate his contributions on the sides of our boat. The auction to the benefit of “Un Regard, Un Enfant”, will be held in 2016. Artists who already said YES!! 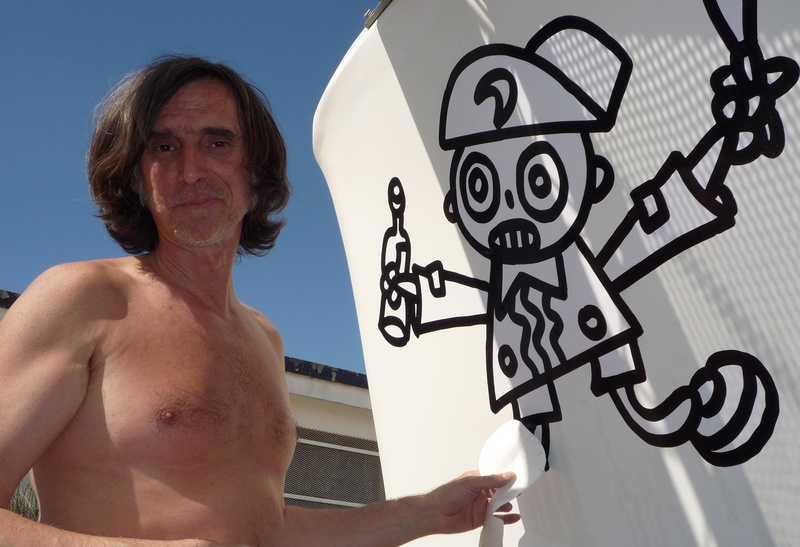 Multidisciplinary artist (painter, draftsman, poster designer, graphic designer, videographer, writer and singer of rock band The Snoc), the artworks of Jofo participate in the collective imagination of french Aquitaine region. The round, falsely naive, small character of Toto runs through one canvas to another for over 20 years, through images of everyday life and the urban world around. Between figuration and free kids drawing between fantasy and transgression, he embodies the energy, spirit and squeaky annoyed Jofo frivolity. Born in 1962 in Petionville, near the outskirts of Port-au-Prince (Haiti). After graduating Jean-Philippe Moiseau began to paint and has never stopped since. 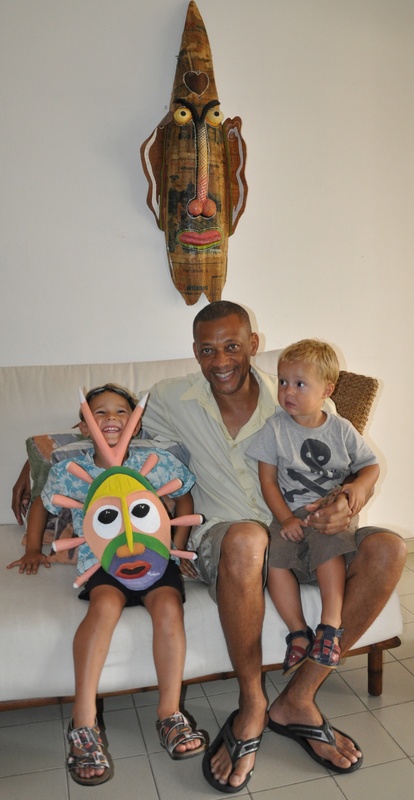 He held his first exhibition in 1984 at the Lycee Petionville in Haiti. If, discovering canvas, beautiful masks, harmonious prints or timeless pieces sculpted by Jean-Philippe Moiseau is a joy and a very emotional moment, listening to him talking about his art is just as rewarding and exciting. This man is endearing, sensible and so true. From the outset, he will admit he does not consider Art as a business, nor is he ready to any concession to sell more and therefore can paint primarily what he likes. If the public likes what pleases him, it’s his only happiness. Located in the Dominican Republic since 1994, he has chosen to exhibit his works in his own studio, before heading back around the world to exhibit his work. For him, that’s what being an artist is. Paint what you feel, in any form whatsoever and to present it around the world. For Yann creating is his balance and self-realization. He starts his painting pasting fragments of newspapers on the canvas before painting. These pieces of history are thus the basis of the work, a surface receiving the eccentric characters that populate his world. Newsprint is somehow the link between when we look at the work (the present) and the time of execution (the past). His paintings depict all kind of characters with eyes staring at us. As a break from their history, they take the time to question us, seem to scrutinize us, suddenly reversing the relation with the viewer of the canvas. Then the magic happens, the poetry, the humor present in Yann’s paintings exercise their power over our imagination. Yann passed away suddenly last May 20, 2014, he will forever accompany our trip! It is a collection of works that invite the intuitive reflection from a dialogue between painting and the viewer, a kind of look at the representation of a possible reality. His pieces are greatly influenced by the Caribbean, the symbols of the Rastafarian culture. He uses few colors, strong brush strokes and paint jet that reflect the emotions and the contradictions of the caribbean with African origins. Characters with thick lips, broad noses and curly hair, inspire his creations, thus exploring the phenomena of marginalization and racism in Cuba and other countries. Joa has participated in over 10 solo and group exhibitions in Cuba, Argentina and Colombia. Born in Baracoa, in the province of Guantánamo in 1940. 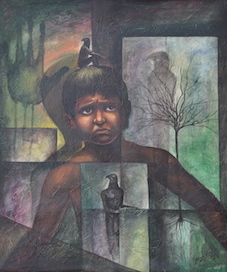 Zuñiga Batista is a self-taught painter and draftsman, representative of the so-called primitive art called «naive». His works recreate Afro-Cuban culture in general and in particular the myths and legends of Gods or Orishas of the Yoruba pantheon. He has made collective exhibitions in almost all provinces of his country. His works have been integrated also to exhibitions in Spain, France, Germany, the former USSR, the Caribbean (Grenada, Dominican Republic, Martinique, Surinam) and other countries. Despite the fact that the international press has praised him, and that private collectors and relevant institutions are struggling to have a ” Zúñiga,” the painter of the Gods » prefers to have the recognition of his public. 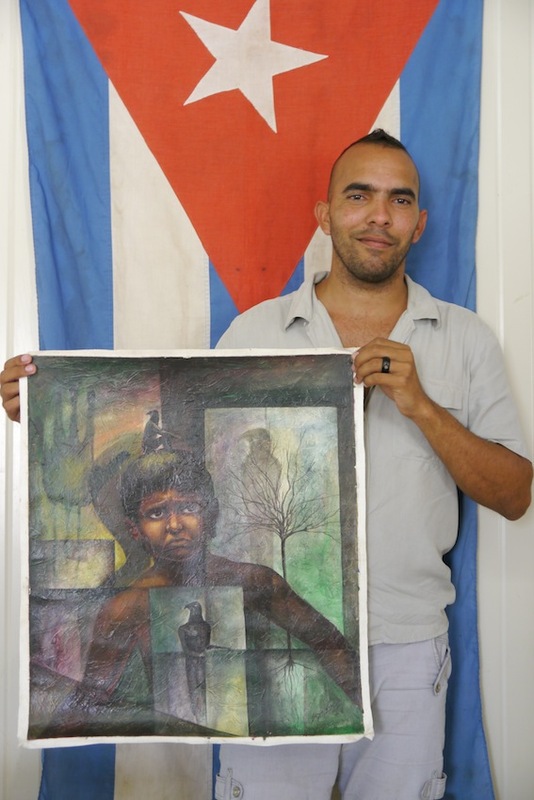 Cromy, Liezenm and Lulus three painters of the rising generation of the village of El Cobre near Santiago de Cuba, embody the new Cuban revolutionary youth in the global fight for the protection of the planet. With Art as their only weapon, they want to awaken the consciousnesses, educate the children of today, as guarantors of the world of tomorrow. 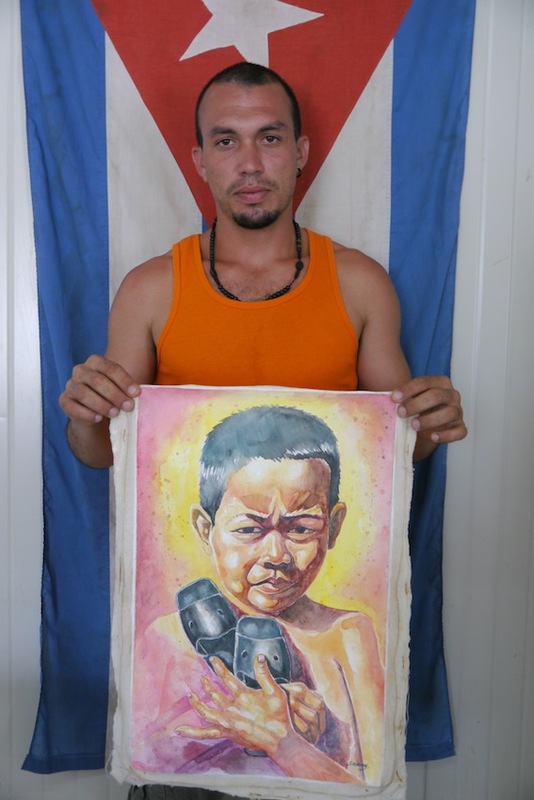 Jorge Ernesto Dominguez aka CROMY (EL COBRE DE SANTIAGO DE CUBA) Since early childhood , Cromy paints, sculpts, draws. Having explored all the techniques available to him at the Casa de Cultura de El Cobre, he then spent four years at the Academy of Fine Arts in Santiago De Cuba. 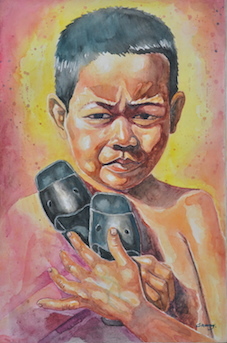 In watercolor, he finds his own words which express his deepest feelings. By mixing the colors straight from the support, Cromy let them be bound, dilute, take life to embody all the strength of the emotions which he wants to share . All in a realistic style giving an excessive photographic impression to the canvas. A collection of paintings that call each other, answer and establish a “dialogue” through which the artist wishes to express the centrality of children on earth, the fragile witness in our rough adults world. The child of “Made in” tightly holds on to his “chancletas” (cuban sandals made of recycled rubber from old tires), as a priceless treasure. This painting evokes the difficult years of the 90’s in Cuba. A secret self portrait of Cromy himself? In this canvas, a child cries in front ofthe suffering of the world . As in the Amerindian legend of the hummingbird, he sheds tears of love to change the world, to attempt to extinguish the fire that little by little consumes our planet. ” At any silver lining ,” said one , Liezenm has made it his philosophy of life and love. “We must take advantage of painful experiences. Our reality, the experience of the Cubans, to feel it, to understand it one must have experienced it and lived like a Cuban. Otherwise it will always escape from your understanding. And a difficult experience always teaches us a lot. Thus, when the Cuban people has the right, like everyone else, to be master of his future, then I think the Cuban people will do great and beautiful things. These last years were as a preparatory stage for a new future and I hope, to show a different pathway to a world more in harmony with Nature and the Earth”. Today Lulus wishes to be the spokesman of a youth that he frequents everyday during the courses of Fine Arts which he gives at La Casa de Cultura. In his paintings he wishes to express the anger of this new Cuban generation witnessing the ecological damages suffered by our planet. “Los sueños son mi luz” (dreams are my light) express the concern but also the pain and anger of the young people of today, describing the urgency in which we find ourselves with no other option in our eyes than to stop our mad and insatiable race to the “always more”. Lulus puts the child at the center of this fragile balance between the Adults (the hand) and the Earth ( the tree). ” Stop! ” Says the brandished hand and the look of the child. Stop this ecological disaster or the human pain expressed in this canvas will not appease. The bird-man, mystical representation of the spiritual Nature, perched on the head of the child, as his 7th chakra, represents spirituality, inspiration, faith, humanitarianism and ethical values. Today Lulus is still hopeful …. that the world could still change, that Humans finally find their true place and dedicate their strengths, their knowledge, their ambitions to take care of our Mother Earth, the only cradle of humanity to Lulus. 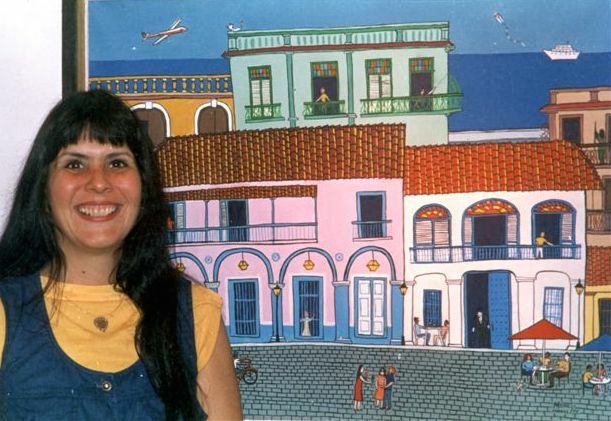 Mercy Rivadulla, painter and architect, created in his paintings an imaginary city (which reflects the aesthetic essence of the colonial buildings of La Havana) inhabited by famous cuban figures like she loves imagining them in her dreams (Jose Marti, Fidel Castro, El Che etc.). Her delicate hand reinvents La Havana, Cuba and its history. Beyond the apparent simplicity of her drawings Mercy’s paintings are rigorously constructed (influence from her architectural and pictorial training) in the service of endless humor.